February 20, 2013 By Tina M 5 Comments This post may contain affiliate links. Read my disclosure policy here. My name is Caleb and my wife is pregnant… sounds like the beginning of an AA meeting, doesn’t it? When my beautiful wife, Brianne, and I decided to try to get pregnant we had NO idea how hard pregnancy can be, specifically dealing with the morning sickness that pregnancy brings. So, I thought it might be valuable for MothersNiche.com readers to hear from a husband’s/partner’s perspective. Before I begin, I just need to say how much I love, respect, and admire my wife. This is our first child and pregnancy and she has and will hold a full-time job through the duration of the pregnancy. I know this isn’t rare per se, there are a lot of moms who do this, but I think it’s amazing considering how sick my wife gets. There are some mornings when I wake up and I look over to see her clutching her stomach with a grimace of sickness. It’s not uncommon while I’m working in the next room (sometimes I work from home) to hear her throw-up one, two, three, or even four times before she heads off to work, but each day regardless of how she feels she peels herself out of bed, dresses, and deals with the sickness through her workday. She is my hero and I love her more than ever for the sacrifice she makes for our family. Now, I want to focus on how her being sick has effected me as a husband. It has been a change for me. Before we married we dated for a year and half and we were quite active, we would go rock climbing, hiking, running (when I could talk her into it), boating, traveling, and we would even workout together. When we got married we jumped on the pregnancy train quickly. We were married in October and found out we were pregnant in December. When “morning sickness” hit, our active lifestyles came to a halt. Brianne felt so sick that it has been hard for her to be as active as she usually is, which is hard for her, especially considering how much she loves the outdoors. For the past 8 years of my life I have worked out at least 6 times a week, since the pregnancy my workouts have decreased from one a day to one every two weeks. Oh, and, “morning sickness” is a misnomer… her morning sickness lasts all day, although morning and late nights seem to be a little more excruciating. I am not complaining, but I am trying to paint a fair picture because we were pretty naive before we became pregnant. 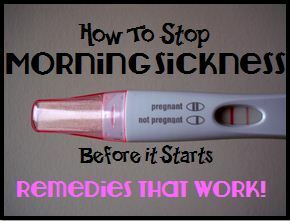 Go here for more tips on how to help your wife during Morning Sickness. I loved reading this! My husband and I are preparing for our first child and this is really neat insight on the guys perspective. I read it to my husband. It’s helpful to know what to prepare for before making such a big decision. Really?!? You are a fairy tale, too good to be true! My kids’ father told me that morning sickness was all in my head. And I was sick the entire pregnancy, both times. “Blessed” with the opportunity to do dishes? It is obvious this was written by a pregnant woman herself! Not realistic but nice article to support each other.